The Hinds Head, Bray | Good. Food. Stories. It’s funny: though London and its surroundings are the hands-down favorite of all the places I have travelled in my life, I’ve never been able to verbalize exactly why. There’s plenty to mention: the museums, the history, the shopping, the Christmas lights, the accents. But more than all those things, something about it just feels like home to me. When I am there, I just feel comfortable and happy. And in few places anywhere in the world am I more comfortable and happy than in a cozy pub. It follows, then, that I had one of the best meals of my life in one of those pubs. The Hinds Head is in a cozy little village called Bray, not too far from Windsor. Since 2004 it has been owned by Heston Blumenthal, whose most famous restaurant, The Fat Duck, is just next door. But while the Fat Duck is known for its high-end molecular gastronomy menu, The Hinds Head is known for classic—even historic—British pub fare. Four of us went for the last meal of my 38th year. 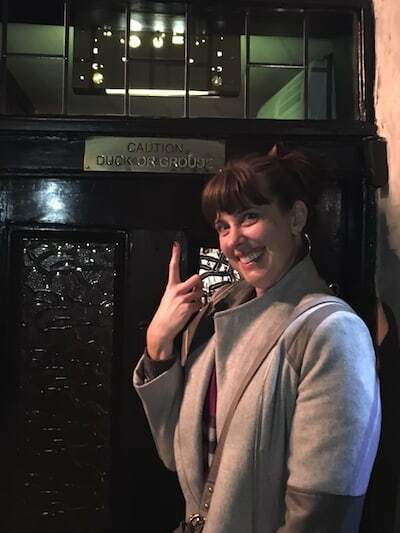 The building dates back to the 1400s, which explains why all five feet and nine inches of me nearly took off her head going through the door, somehow missing one of the many “Caution: Duck or Grouse” signs on all of the diminutive doorways. The interior is simple: dark wood, beams, various small rooms with faded carpet, everything you expect from a cozy pub. The menu seems fairly simple and classic as well, but the food… there’s a reason this place earned itself a Michelin star. 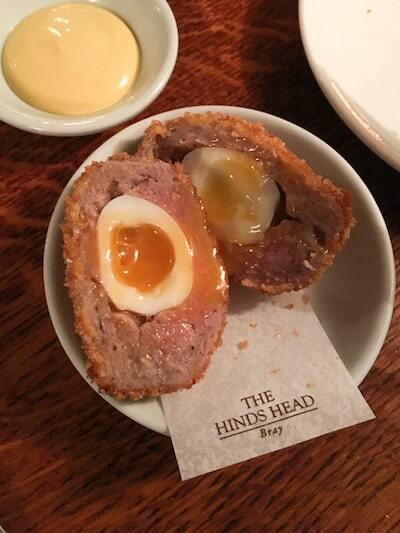 We all started with a Scotch egg—my first!—which at the Hinds Head is a petite quail egg wrapped in sausage, breaded and fried. If, say, one had hypothetically had a little too much champagne with friends the night before, the egg’s oozing golden yolk and crispy but not greasy shell would be restorative comfort. And, being in a pub on a cold night, comfort was the name of the game. As a main course, I couldn’t have chosen better than the creamy chicken, ham, and leek pie. A quintessentially British ceramic pie vent peeking through the center of the pastry left it golden and flaky; paired with light, smooth mashed potatoes and a side of carrots that had possibly been boiled in pure butter, I was left with a meal that made me feel as warm and fuzzy as if I was curled up with any variety of Colin Firth movie in a squashy armchair inside Downton Abbey itself. At the Hinds Head, being full to the point of bursting is no excuse for missing out on dessert. We sampled historic offerings of chocolate wine (do you like chocolate? Do you like wine? Do you like the idea of them being mixed into a velvety warm drink that goes down way too fast? 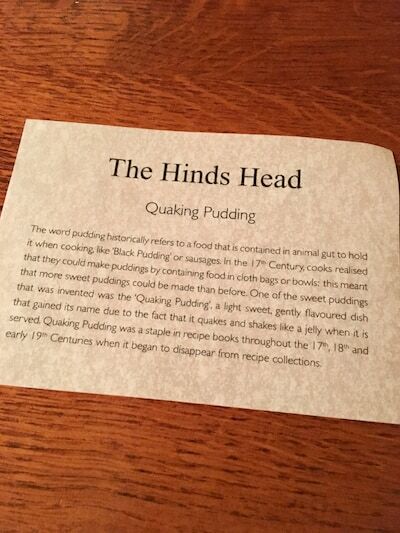 Then this is for you) and quaking pudding (named because of its wobbly texture)—both of which came with their own information cards detailing how the recipes were based on ones hundreds of years old. But for my birthday “cake,” I went with another British classic, the Bakewell tart. The Hinds Head deviates from tradition a bit with their Bakewell tart recipe: there is no pastry shell and no layer of jam. 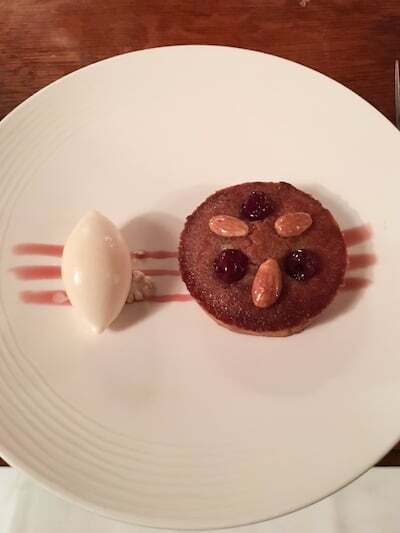 Instead, their version was more of an almond cake resting on a plate striped with jam, with almonds and cherries garnishing the round. The taste was almost like marzipan in cake form, which is to say, for this marzipan-loving girl, positively delicious. But it was the simple yoghurt ice cream with which it was paired that was the real star. The creamy, mild little dollop was the perfect topping for the tart and could have punctuated the meal all on its own. Each dish sounds deceptively simple, but the combination of flavors, textures, and setting combined to make it arguably one of the best meals I have ever had. Comfort food can be, and in this case was, exquisite when done well. 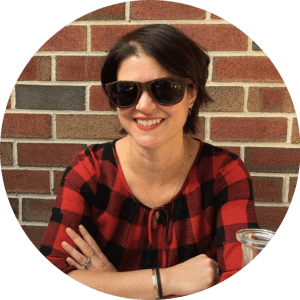 The meal was an embodiment of the feeling I get each time I go to England: like slipping on something comfortable and settling in with a friend, perfectly at ease.